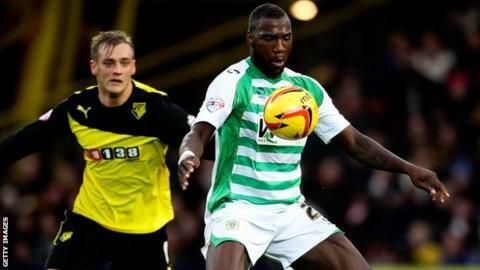 Yeovil boss Gary Johnson has confirmed Ishmael Miller has left the club after walking out of a team meeting. The 27-year-old striker joined the Glovers on loan from Nottingham Forest in January for the rest of the season. "He is no longer with the club. I don't think his personality and football personality are conducive to our environment," explained Johnson. "I'm not sure if he's back with Forest. He's in a bit of limbo, we thank him for his goals and we move on." Miller scored 10 goals in two loan spells with the Glovers but Johnson told BBC Somerset that the former Manchester City striker stormed out of a team meeting. "He didn't want to get involved in a discussion and he ended up saying 'OK, I don't want to play for you'. He walked out of the room. That was the third time and we can't let that happen," added the Yeovil boss. "I can't have passengers at this time. I had to make a big decision and I did it for the right reasons."